quarrygirl.com » Blog Archive » best. breakfast. ever. oh, what a breakfast! 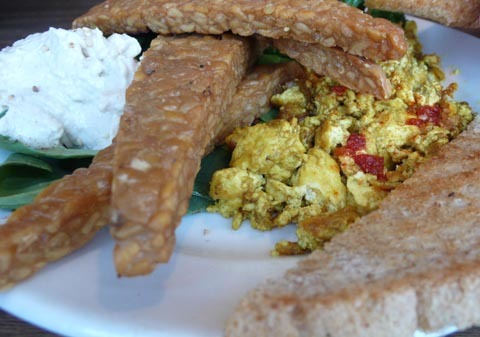 the tempeh scramble is one of the best scrambles i’ve ever tasted, and that’s just the tofu part! on top of that, it had luscious long slices of tempeh, fresh vegetables, and globs of tahini. woo hoo! 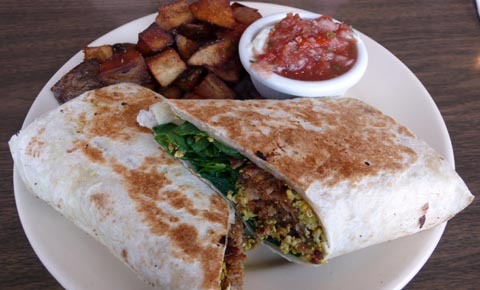 and wayward’s breakfast burrito, is by far the most awesome one i’ve ever had. 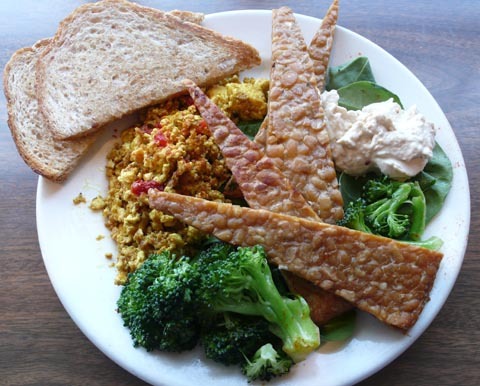 the tvp was crunchy and thick and the tofu was the same flavorful stuff from the tempeh scramble. 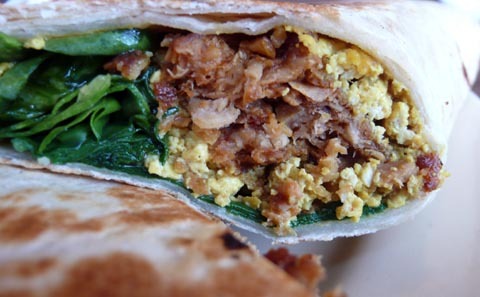 most breakfast burritos are fat and awkward, rolled into a huge blob that needs to be eaten with fork. this burrito was smaller and more delicate—-all the ingredients in a tightly wrapped, grilled tortilla, cut in half so it was easy to eat without utensils. the home fries were perfectly cooked and deliciously seasoned, and the fake sour cream and salsa mixture was incredible. the atmosphere is alright, kind of like sitting in a self-righteous vegan teenager’s bedroom….except with tables and booths. but i don’t really mind that. the staff are cool and friendly, hip seattle vegans who have lots of tattoos, crazy hair, and don’t shave their armpits. 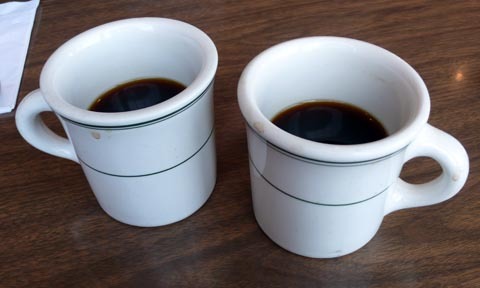 the bathroom is really disgusting (i didn’t take a picture), so i strongly urge you to hold it if you can…and maybe not drink so much coffee. overall, i loved the wayward cafe. when a restaurant has vegan food that’s this good, nothing else about it really matters. check it out and please tip well. 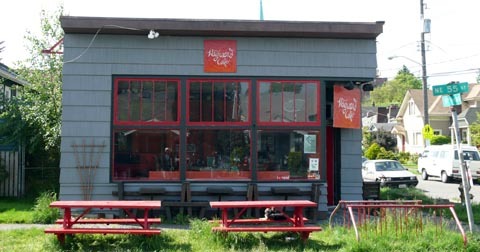 i want this place to be really successful so it’s still around when i go back to seattle. hello quarry girl, whom after reading the about realized you are not in fact a girl. 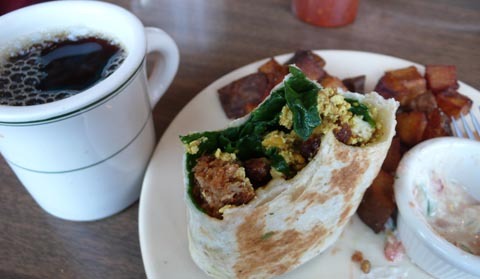 i saw your photo at foodgawker, and clicked just because i caught the word SEATTLE and said oooooooooooh. im from seattle and always miss it no matter where i am. 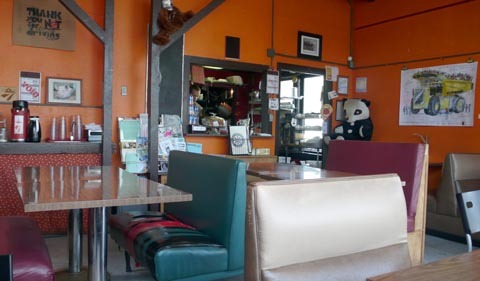 but hey this restaurant looks cute, ive never heard of it before, probably because i eat a lot of meat, but i think we can be friends anyways. 🙂 i’ll try to get to it next time im there. the sad face on the “no comments” made me really want to comment to upturn that from. have a fantastic day—even if its raining, i don’t know if it is but just in case, because it’s raining. here. also serves some of the best vegan sandwiches ever. and delish iced tea. theres a co op bike shop/repair shop in the back.